There was no room in the book for this (bibliography was already rather enormous) but I thought it necessary to credit these pieces somewhere. So here’s the front line of Bowie reporting. So many impressions, quotes, descriptions, etc. that make up much of any Bowie biography or critical study are owed to the work of ill-paid music journalists, who went to the shows and backstage, who talked to Bowie, his managers and his labels. Collectively these articles offer an invaluable resource: the eyes, ears and thoughts of Bowie’s contemporaries, untainted by revision. And it’s important to note that many of these writers were women—Penny Valentine, Lisa Robinson, Sheila More, Mary Harron, Ellen Willis, Kate Simpson, Lillian Roxon and more. Below is a list of articles I found in my research (1971-1976 are on another page). I read the majority of them, but some I know only via references in other books and compilations. Kevin Cann’s essential Any Day Now is an enormous reference for documenting and sometimes reprinting 1960-1974 articles. Bowie Wonderworld has a decent number reprinted, as do (starting in 1972) Ziggy Stardust Companion and (starting in 1974) Golden Years. If you know of any other contemporary Bowie articles not found in these lists, let me know and I’ll add them. 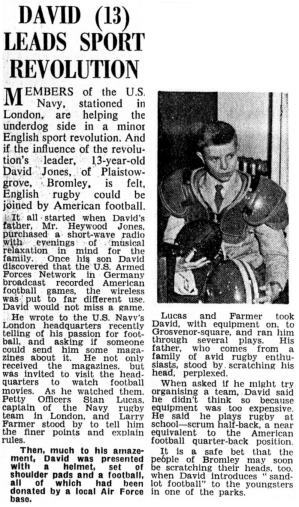 “David (13) Leads Sport Revolution,” Bromley & Kentish Times, 11 November 1960. “Nearly 4,000 at School Fete,” Bromley & Kentish Times, 22 June 1962. “Konrads to Cut a Disc,” Bromley & Kentish Times, 23 August 1963. “A.C.B.,” “West Wickham Strikes Blow for the ‘Pops,” unknown paper, ca. 25 October 1963. “Bloom Goes Into Pop,” Evening News, 4 June 1964. “Liza Jane (review),” Bromley Times, 5 June 1964. “Liza Jane (review), New Musical Express, 5 June 1964. Thomas, Leslie, Evening News (column on DB and the King Bees), 5 June 1964. Nightingale, Anne, “Liza Jane” (review), Evening Argus, 17 June 1964. “D. Jones and Co,” Record Mirror, 20 June 1964. Chatham Standard (article on Bowie joining Manish Boys), 18 August 1964. Beat 64 (diary item on Bowie), September 1964. “Hair Abounds!,” Beat 64, October 1964. Beat 64, (article on Bowie and Manish Boys), November 1964. Thomas, Leslie, “For Those Beyond the Fringe,” Evening News, 2 November 1964. Chatham Standard (interview with Manish Boys’ Paul Rodriguez), 15 December 1964. “Row Over Davie’s Hair,” Daily Mirror, 3 March 1965. “All Set! 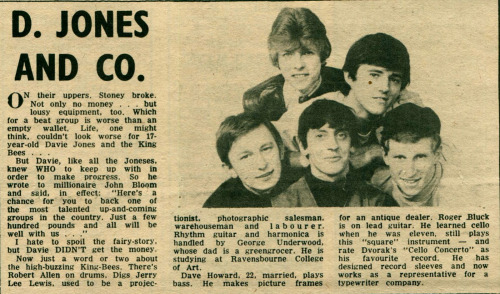 As Davy Jones Has a Trim and a Set,” Evening News and Star, 8 March 1965. “Gadzooks! It’s All Happening,” Radio Times, 8 March 1965. “Home Grown (“I Pity the Fool” review),” Chatham Standard, March 1965. Kent Messenger (article on breakup of Manish Boys), 21 May 1965. “Bit Much,” Bowie letter to Melody Maker, 10 July 1965. 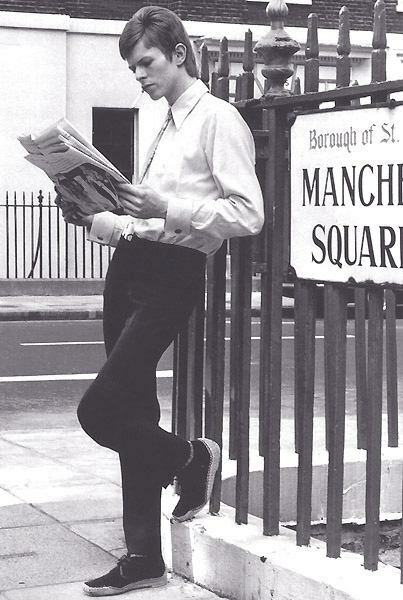 “Davie…,” photo caption (p: Roy Carson), Record Mirror, 14 August 1965. “Davie Changes His Hairstyle and His Group,” Kentish Times, 20 August 1965. “Thanet Group Should Reach Top 30,” Kent Messenger, ca. 20 August 1965. “’You’ve Got a Habit of Leaving’ (review),” Record Mirror, 11 September 1965. Fabulous (fashion photo shoot & caption), 2 October 1965. Boyfriend, (fashion photo shoot), October 1965. “Can’t Help Thinking About Me (review),” Record Retailer, 6 January 1966. “Can’t Help Thinking About Me (review), NME, 14 January 1966. “Pop Star Changes His Image,” Kentish Times, 14 January 1966. “Hey Presto—There’s a New Name From Davie Jones’ Locker,” Music Echo, 22 January 1966. Kentish Times (article on Bowie and Ralph Norton), 28 January 1966. King, Jonathan, “Bowie’s Record Does Not Deserve to Die,” Music Echo, 13 February 1966. “A Message to London from Dave,” Melody Maker, 26 February 1966. “Pop Group’s Hopes Dashed,” (Phil Lancaster interview on Lower Third’s breakup), Walthamstow Independent, 11 March 1966. Springfield, Dusty, “’Do Anything You Say’ (review),” Melody Maker, 2 April 1966. Fabulous (Bowie mention), 16 April 1966. 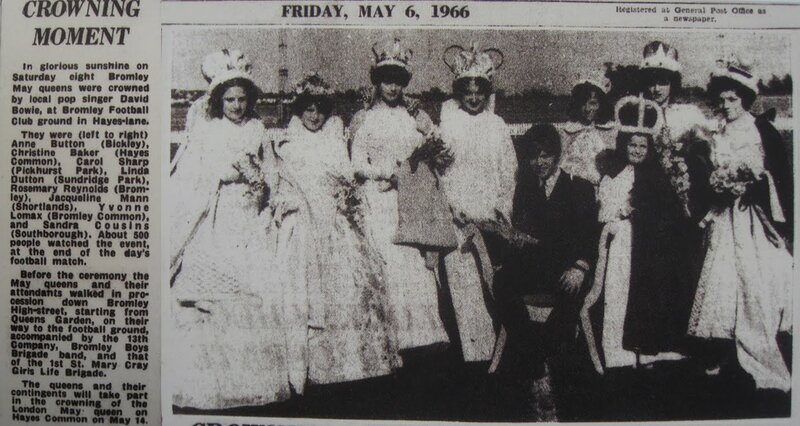 “Crowning Moment” (article on Bowie at the Bromley May Queens), 6 May 1966. “Big L Disc Night,” Kent Messenger, 26 August 1966. “’Rubber Band’ (review),” Disc & Music Echo, 2 December 1966. “Are These the ’67 Chartbusters?” Disc & Music Echo, 31 December 1966. “’The Laughing Gnome’ (review),” NME, 15 April 1967. “David Bowie (LP review),” Record Retailer, 3 June 1967. “Hear David Bowie—He’s Something New,” Disc & Music Echo, 10 June 1967. “David Bowie (LP review),” NME, 24 June 1967. “Love You Till Tuesday (review),” Record Retailer, 15 July 1967. Jones, Peter, “Love You Till Tuesday (review),” Record Mirror, July 1967. Valentine, Penny, “Love You Till Tuesday (review),” Disc, July 1967. Welch, Chris, “Blind Date With Syd Barrett (inc. ‘Love You Till Tuesday’ review),” Melody Maker, 22 July 1967. Jackie (item on DB), 22 July 1967. Osbourne, Christine, “On Our Wavelength,” Fabulous 208, 29 July 1967. “Love You Till Tuesday (review),” Cashbox, 2 September 1967. Deane, Barbara Marilyn, “Today I Feel So Happy,” Chelsea News (Bowie interview), 15 September 1967. 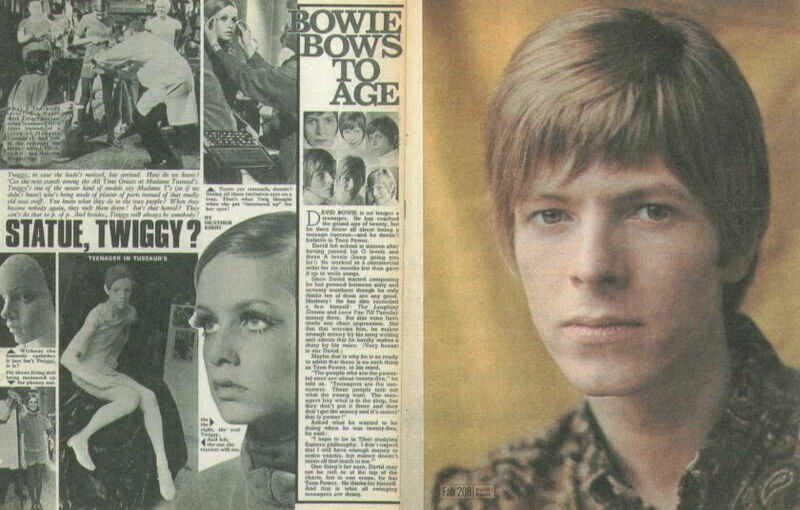 “Bowie Bows to Age,” Fabulous 208, 30 September 1967. Hyland, Mike, “In the Groove,” Schenectady Gazette, 21 October 1967. 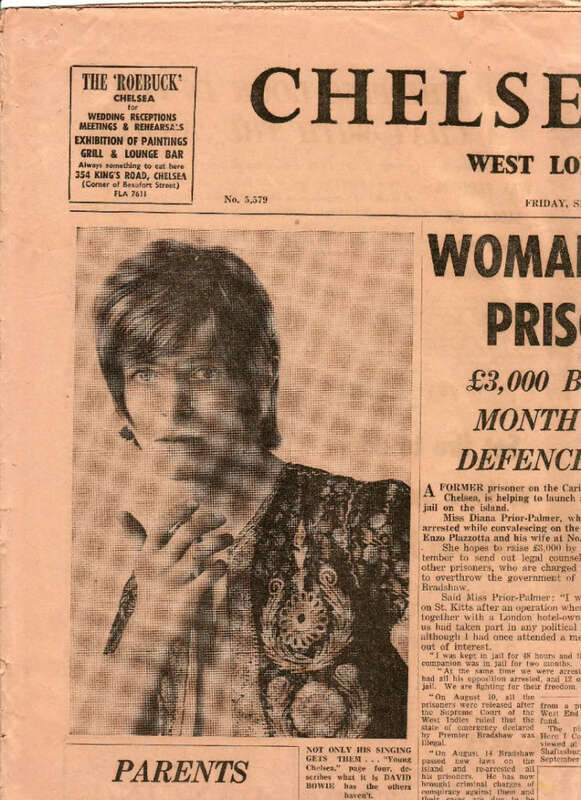 “The Lean and Dreamy David,” Fabulous 208, 25 November 1967. “On the Air and On the Boards,” Bromley Advertiser, 21 December 1967. Bromley Times (article on DB current activities), 22 December 1967. Chapman, Don, “Miming Promise (review of ‘Pierrot in Turquoise’),” Oxford Mail, 29 December 1967. Young, B.A., Financial Times (review of ‘Pierrot in Turquoise’), 29 December 1967. “Pierrot in Turquoise (review),” The Stage, 1 January 1968. “Eye Spy!,” Jackie, 3 February 1968. Roberts, Peter, “Burlesque in Rhyme,” The Times, 8 March 1968. Farjeon, Annabel, Evening Standard (‘Pierrot in Turquoise’ review), 8 March 1968. “Bromley 21-Year-old Songwriter Goes On Stage,” Bromley Times, 8 March 1968. “Pierrot in Turquoise (review)”, Stage and Television Today, 14 March 1968. “Rex Set: Festival Hall, June 3,” International Times (review of T. Rex/DB show), 14-27 June 1968. More, Sheila, “The Restless Generation: 2,” The Times, 11 December 1968. Evening News (article/photo on Love You Till Tuesday), 14 February 1969. Croydon Advertiser (poss. DB article? unconfirmed), 21 February 1969. Finnigan, Mary, “Announcement of Beckenham Arts Lab,” International Times, 23 May-5 June 1969. Valentine, Penny, “David Bowie—Amazing Sound! (“Space Oddity” review),” Disc & Music Echo, 12 July 1969. Welch, Chris, “Space Oddity (review),” Melody Maker, 12 July 1969. 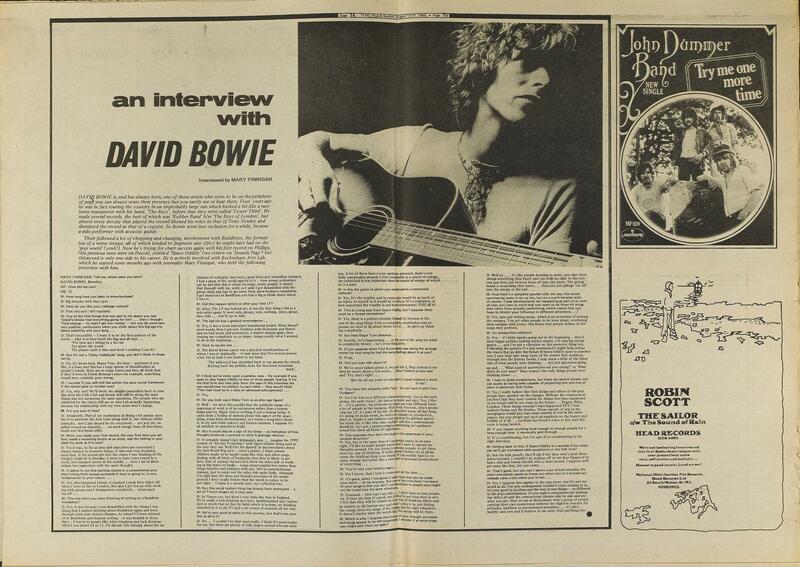 Finnigan, Mary, “An Interview With David Bowie,” International Times, 15-21 August 1969. Classen, Jojanneke, “Bowie’s Great Love is His Arts Lab,” Het Parool, 30 August 1969. Welch, Chris, “Beckenham Arts Lab,” Melody Maker, ca. September 1969. Welch, Chris, “A Mixture of Dali, 2001 and the Bee Gees,” Melody Maker, 11 October 1969. Record Mirror (Bowie interview), 11 October 1969. “Chart Control to David Bowie,” Disc & Music Echo, 11 October 1969. Norman, Tony, “David Bowie Hopes to Take Over a Road!,” Top Pops, 25 October 1969. Valentine, Penny, “David Bowie Says Most Things the Long Way Round!” (& “David Bowie: track by track”), Disc & Music Echo, 25 October 1969. “This Is David Bowie (Space Oddity review)”, Music Now!, November 1969. “Bowie TV Special, Solo Concert,” NME, ca. November 1969. Coxhill, Gordon, “Don’t Dig Too Deep, Pleads Oddity David Bowie,” NME, 15 November 1969. “Popsterren Over Popplaten [Pop Stars on Pop Records]” (Bowie reviews new singles), “David Bowie: Hit After 5 Years,” Muziek Expres, November 1969. “Outsaspace, Outasight,” Fabulous 208, 27 November 1969. Palmer, Tony, “Up to Date Minstrel,” The Observer, 7 December 1969. Simpson, Kate, “David Bowie: His Thoughts and Ideas Revealed,” Music Now!, 20 December 1969. 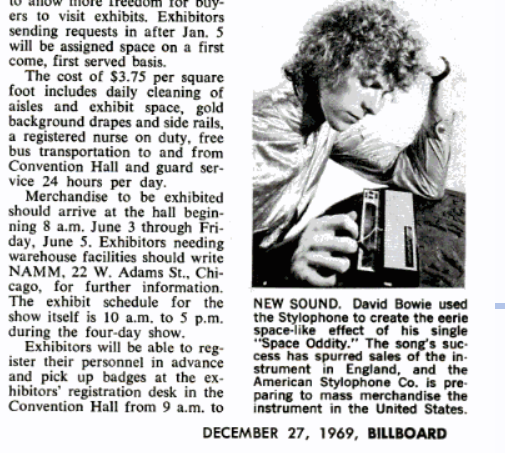 “New Sound” (photo caption, DB and Stylophone), Billboard, 27 December 1969. 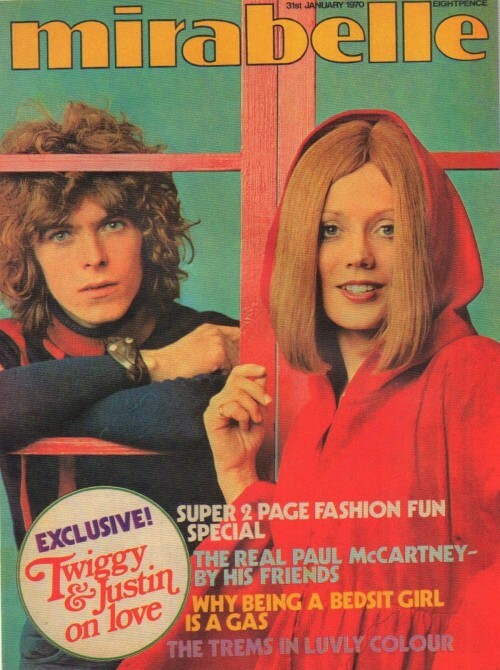 Fabulous 208, 27 December 1969 (Bowie and Angela Barnett on cover). Robbie, Sandie, “A Real Pop Oddity,” Mirabelle (DB as cover model), 31 January 1970. Valentine, Penny, “A New Star Shoots Upwards and One Still Shines,” Disc, 14 February 1970. Nightingale, Anne, Daily Sketch (column mentioning Bowie), 14 February 1970. “He Likes Our Fish ‘N Chips!” Hull Times, ca. mid-February 1970. “Bowie Group,” NME, 5 March 1970. Johnson, Derek, “The Prettiest Star (review), NME, 7 March 1970. Jones, Peter, “The Prettiest Star (review),” Record Mirror, 7 March 1970. Valentine, Penny, “The Prettiest Star (review),” Disc & Music Echo, 7 March 1970. Music Business Weekly, (Prettiest Star review), 7 March 1970. 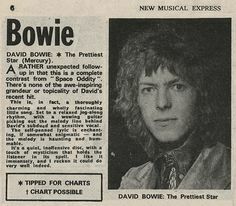 Daily Mirror, (Prettiest Star review), 7 March 1970. “David Bowie: A Real Cool Guy,” Mirabelle, 7 March 1970. Petrie, Gavin, “Bowie’s Bow,” Disc and Music Echo, 12 March 1970. “The Bridegroom Wore Satin…” (DB wedding), Bromley Times, 27 March 1970. Telford, Raymond, “Hype and David Bowie’s Future,” Melody Maker, 28 March 1970. Hughes, Tim and Trevor Richardson, “Bowie For a Song,” Jeremy, March 1970. Tremlett, George, “Face to Face With David Bowie—My Lost Year,” Jackie, 10 May 1970. Valentine, Penny, “David Bowie: Music and Life,” Sounds, ? 1970.